Get quick and easy additional storage with our fast folding storage. Open up or fold down in under 20 seconds. Folds flat for easy storage‚ no tools required. Choice of 3 sizes and 2 fantastic colours. 4 Bays of Budget Blue Shelving + 1 Workbench. Choice of 3 depths – 300 450 or 600mm. Each bay complete with 5 chipboard shelves. Each shelf takes up to 175kg. Boltless – only needs a mallet to assemble. Workbench can hold unto 300kg UDL . If you are looking for good value shelving, look no further than our excellent range. Each of our value shelving products is created to the highest standard – proving that quality really doesn’t have to break the bank. Value shelving with 5 shelves – Our lowest priced shelving solution, available in a choice of 3 shelf depths. Choose from 300mm, 450mm and 600mm depths. Ideal for both the home and the garage, these shelves are easy to assemble and can take up to 175kg in weight. There’s also a galvanised steel variation available and for those with larger storage requirements, we also offer a discounted three pack bundle. Garage shelving space-saver system – This exceptionally strong garage shelving solution is quick and simple to assemble. With boltless installation, it simply clicks together for a sturdy, strong build. Finished with a tough powder coating, the shelves are protected from rust. The shelves have been designed with heavy duty use in mind and can hold up to 580kg UDL per level. You have the option to add 5 strong storage boxes too. Medium duty shelving – One of our most flexible value shelving solutions, each shelf is fully adjustable. They are available in a wide choice of depths and widths and come with simplistic boltless assembly. You can also choose from five different colour variations. 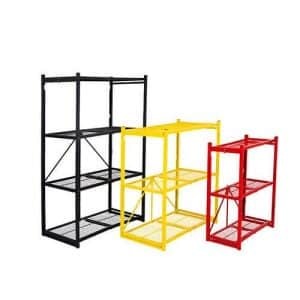 Suitable for use in a wide range of environments, these affordable shelving units even come with a buy 2 get 1 free offer. Heavy duty shelving – Some of our strongest value shelving for home and business, they are capable of holding up to 400kg UDL per level. Constructed from 2mm thick European structural quality steel, they are finished with a strong powder coating. We also offer a Buy 3 Get One Free deal on this range. At Garage Shelving, we truly care about our customers and are passionate about providing top quality, low cost shelving solutions. Each of our value shelving products are designed to be freestanding, though you do have the option to add wall fixings and floor fixings onto your purchase for a more secure assembly. Not only are our shelves easy to put together, but they’re also finished with galvanised steel or a tough powder coating to prevent rusting.